LOWELL, Mass. – Stephen King’s words on page and screen have thrilled and chilled fans for three decades, but opportunities to hear those words spoken by the author himself are rare. For one night only, King will take to the stage at the Tsongas Center at UMass Lowell, offering fans the chance to hear King read his work, ask him questions and listen to him discuss his passion for writing and his advice for aspiring authors. 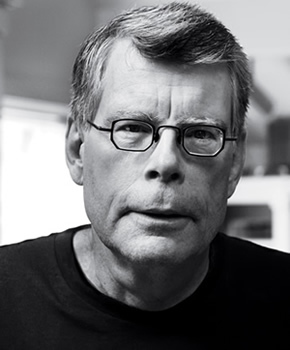 “A Conversation with Stephen King” – set for Friday, Dec. 7 at 7:30 p.m. – will be moderated by Andre Dubus III, bestselling author and professor in UMass Lowell’s English Department, the program’s co-sponsor. King’s appearance marks the debut of the new UMass Lowell Chancellor’s Speaker Series. Tickets to the Dec. 7 event go on sale to the public Friday, June 1 and are $30 (plus $2 facility fee) for general admission and $50 ($2 facility fee) for reserved floor seating. Tickets will be sold at the Tsongas Center box office, www.tsongascenter.com and 866-722-8780. Admission is free for UMass Lowell students with valid ID who obtain tickets in advance at the Tsongas Center box office. “Writing requires not just a creative mind and some good ideas, but also dedication to the craft. I look forward to sharing my experiences as a writer and the lessons I have learned with UMass Lowell students and the public,” said King, who will hold a special master class for UMass Lowell creative writing majors during his visit to the university. To further support UMass Lowell students, King and his wife, Tabitha, will endow a new scholarship fund in their names. King will donate his fee from the UMass Lowell appearance and at least $5 from every ticket sold for the Dec. 7 event will go to this scholarship fund. King’s nearly 35-year literary career includes publishing more than 50 full-length books that have sold more than 350 million copies, as well as many short stories, essays, anthologies and novellas. King’s early thrillers, like “Carrie” and “The Shining,” put him on the map, not only as a writer of popular horror novels, but also one whose work could be successfully adapted for films and television. More than 50 of his works have been turned into movies and miniseries, and many have garnered critical success, including “The Shawshank Redemption” and “The Green Mile,” both of which were nominated for multiple Academy Awards. King made his directorial debut with “Maximum Overdrive,” which was based on one of his short stories, and collaborated on “Ghosts,” a 40-minute music video in collaboration with Michael Jackson. King, who also published work under the pen name Richard Bachman, is best known for crafting tales that terrify. But he is also the author of nonfiction books like “On Writing,” his self-described “memoir of the craft,” and “Faithful,” a chronicle of the Boston Red Sox 2004 championship season co-written with Stewart O’Nan. Last year’s “11/22/63” was King’s first work of historical fiction, set around the assassination of President John F. Kennedy. King has penned columns and opinion pieces that have appeared in publications and websites, including Entertainment Weekly and the Huffington Post, and he has made several TV and movie appearances. His body of work includes comic books, audio books and the novella “Ur,” written exclusively for release as an e-book for the Amazon Kindle. King is the recipient of numerous honors, including the National Book Foundation Medal for Distinguished Contribution to American Letters and the Mystery Writers of America Grand Master Award.